This study is registered in ClinicalTrials.gov NCT01610817. According to a recent report of the Canadian Patient Safety Institute, the management of adverse drug events (ADEs) in primary medical care is a public health priority . 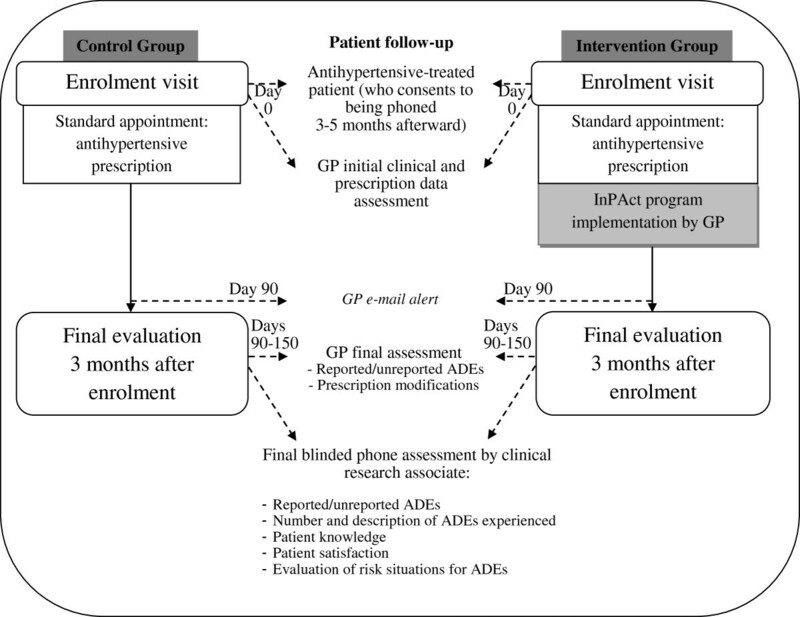 The proportion of patients presenting an ADE within the first three months following an ambulatory drug prescription was estimated to reach 25% in Gandhi et al. . Cardiovascular drugs have been found responsible for 20% to 30% of hospitalisations for ADEs; meanwhile, 20% to 40% of ADEs could be prevented [2, 3]. A lack of information and communication between patients and health care professionals has been identified as an underlying factor favouring the occurrence of ADEs [4, 5]. A significant proportion of ADEs and associated complications could be prevented if risk situations were detected earlier and if patients were better informed about participating in their own medical care and about reporting ADEs . In the InPAct (Information for Participating Actively) study, we focused on the reporting of ADEs by patients. Because clear differences have been shown between reports emanating from patients and those emanating from health professionals, it is essential that patients be able to report ADEs in order to supplement the reporting of ADEs by health professionals [7, 8]. It has been found that patients report ADEs four times less often than do health professionals [7, 9]. Considerable variations have been observed from one country to another in terms of the proportion of total ADE reports submitted by patients as opposed to the proportion submitted by health professionals . In France, according to data from the ANSM (French National Agency for the Safety of Medicines and Health Products), only 1% of official ADE reports are made by a patient. We decided to focus on ADE reports made by antihypertensive-treated patients in primary care for three reasons. First of all, hypertension is common, with two-thirds of people older than 65 affected by this condition in developed countries . Also, drug prescriptions for this sector of the population are often composed of at least four different drugs, which increases the risk of ADEs [12–14]. Finally, the proportion of patients experiencing at least one ADE within the first three months following the prescription of an antihypertensive has been estimated at 12.6% . In the InPAct protocol, eight clusters of several GPs were defined. Four steps, one unit (U) of two clusters per step, and five periods (from P1 to P5) of three-month duration were defined. In the first period, the InPAct program will not be implemented. The InPAct program will be rolled out sequentially to the four GP cluster units over the last four time periods (Figure 1). The order in which the clusters will take part in the program is determined at random, allowing the full implementation of the intervention by all participating GPs by the end of the trial [16, 17]. InPAct study design. One unit of randomisation (U1, U2…) contains two clusters of general practitioners, who implement the InPAct program during the same period of time (P2 to P5). 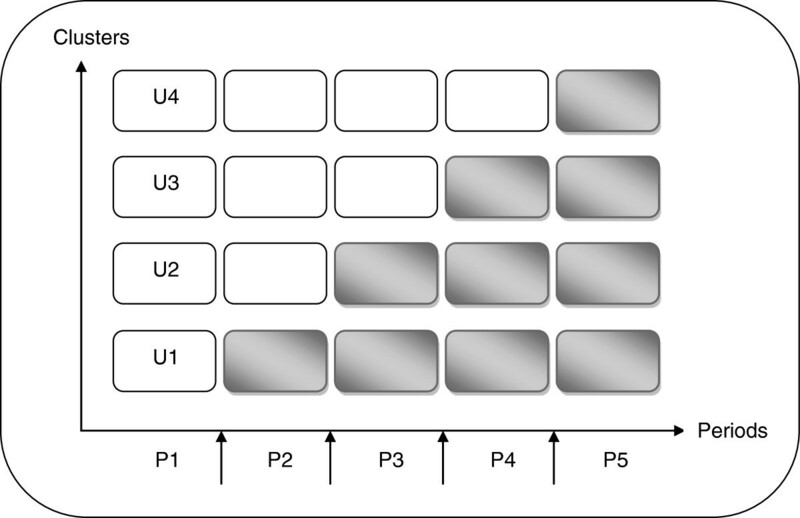 Non-gray cells represent control units. Gray cells represent units in which the InPAct program was implemented. The expected percentage of hypertensive patients reporting at least one ADE is determined as follows: the proportion of patients with ADEs within the first three months of antihypertensive treatment has been estimated at 12.6% in Gandhi et al. ; and the frequency of ADEs reported by patients has been estimated to be four times lower than that reported by health professionals and seven times lower than that reported by GPs [7, 9]. Our hypothesis is that when four patients experience an ADE, only one reports it. We have therefore estimated that prior to the implementation of the InPAct program, 3% of antihypertensive-treated patients would report an ADE. The stepped wedge trial design used in this study is a particular form of cluster randomised controlled design that is especially useful for the evaluation of patient safety programs in general practice. Findings from such a study design have been shown to generate sound scientific evidence and may make it easier to implement complex health interventions. The CRCT stepped wedge design can prove the effectiveness of an intervention with more robustness than can non-randomised designs, in particular in the case of routine implementation. This design is particularly relevant when for logistical, practical or financial reasons, it is difficult to deliver the intervention simultaneously to all of the clusters [15–17]. There are also statistical advantages to choosing a CRCT stepped wedge trial. First of all, GPs are their own controls in both control and intervention groups. This improves comparability in both groups. The CRCT stepped wedge design may also require fewer clusters than a CRCT parallel group design to ensure similar group comparability, in terms of population characteristics. This design therefore increases statistical power compared to parallel group design, because the program effect is estimated not only by between-cluster comparisons but also by within-cluster comparisons. This suggests that the use of a stepped wedge design should decrease patient sample size, compared to a classic CRCT parallel group design [17, 20, 32]. For the InPAct study, the number of patients to be included (1,200) was calculated to be strongly reduced with a stepped wedge design versus a classic CRCT design, in order to maintain the statistical power of 80% and a cluster number of eight. Additionally, the effects of time can be included in our choice of statistical model, which allows temporal changes in the effectiveness of the program to be considered [16, 17, 20]. Indeed, the opportunities arising from modelling the effects of time can be illustrated by considering the stepped wedge design as a multiple-arm parallel design, in which the research aims not only to assess intervention effects, but also to determine whether time of intervention affects the effectiveness of the intervention. Such time effects can include seasonal variations both in GP practice and in the reporting, occurrence and progression of ADEs. In general practice, the seasonal variability in the workload of GPs may negatively affect both their availability for providing health information and the effectiveness of the intervention for the patient. The behaviour of both GPs and patients could also be influenced by external factors that are independent of the study, such as a public campaign about a reporting system for ADEs. For the patients, diuretic antihypertensive-associated ADEs such as dehydration may be more serious in summer due to high temperatures. Even if including time as a random effect could be an advantage of the stepped wedge design, Hussey and Hughes have suggested that a relatively complex model might be required to take into account the time effect . The authors acknowledge the help of all general practitioner investigators and methodologists (Dr. MA. Le Pogam, Pr. F. Gueyffier) and physicians (Dr. A. Badet-Phan, Pr A. Moreau, Dr. L. Letrilliart, Dr. M. Chanelière) who contributed to discussions regarding this study protocol.